Observing the machinations of the Kardashian-Jenners is not unlike watching a competitive ballgame. Though they are a close-knit family and prone to stick together as families do, there are also internal micro-struggles for supremacy, just as any group of siblings sustains a rivalry (in the parlance of psychoanalysis)—except in this instance, the rivalry is for that of admiration, fame, and free clothes on a global scale. Kim Kardashian West is the most obvious starting player, having parlayed a styling career and an unfortunate entree into fame into a worldwide brand that included, last year, her debut Vogue cover. Kris Jenner, though, is always running neck-and-neck with her second-born, as momager and (some say devious) mastermind of the entire Kardashian-Jenner clan’s ensured longevity or, at the very least, sustainable wealth. Yet the younger Jenners, just coming into their own, should not be slept on; Kendall has quickly made a name for herself as an in-demand, new-generation fashion model, while Kylie, just 18, is a reigning king of Instagram and has her whole future ahead of her. With recent-ish additions North West, Mason Disick, and their younger counterparts on the rise, there’s no telling how long the Kardashian-Jenners may reign as the royal family America deserves—but their dynastic hold on our imaginations now seems destined to span decades. Still, the fight for most-recognized Kardashian-Jenner—in a family, and culture, that masterfully translates recognition into actual currency—is a constantly rotating fulcrum. It’s quantifiable, in the same way a college basketball tournament or the National Football League are quantifiable—by easily calculated points, albeit within a different rubric under less predictable terms. And because it’s quantifiable, there’s almost an unquenchable desire to do so, to keep score, same as the magnetic pull of the Kardashian-Jenners themselves has consumed our attention and fascination. On Keeping Up With the Kardashians, their outsized, paparazzi-documented lives are often such recognizable day-to-day banalities that our enthrallment is, in part, because we really want to believe they truly are just like us. 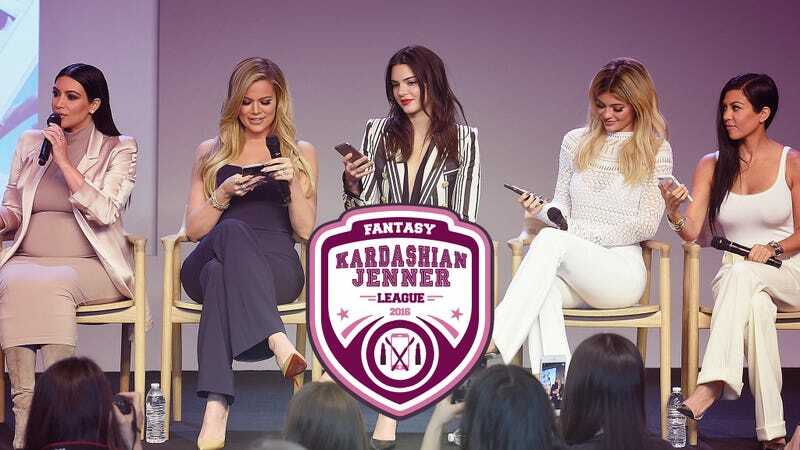 Hence, the debut draft for Jezebel’s first annual Fantasy Kardashian-Jenner League. It will be made up of five teams, with four Kardashian-Jenners to a team. They include Team Bible (Clover Hope), Team Bush & the Tush (Kate Dries), Team The Gross Fan (Bobby Finger), Team I Thought You Hate Hot Pink (Julianne Escobedo Shepherd) and finally, Team Nobody (Jia Tolentino). Scoring will be based entirely on mentions of team members on five major gossip websites—TMZ, E!, Daily Mail, Bossip, and Radar—and will be tallied weekly until the Fantasy Kardashian-Jenner League Playoffs, held January 9, 2016 (the same day the NFL playoffs begin; a coincidence, to be sure). Point spread for other major developments (surprise pregnancy, surprise TV spin-off, etc) adjusted as necessary. Illustration by Bobby Finger. Images via Getty.